January 26, 2011 - Typhoon, the leading edge swing-role combat aircraft continues to protect the UK airspace around the clock. 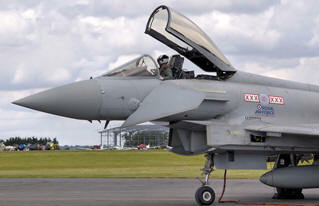 Across the world the six Air Forces who operate Typhoon have passed the significant milestone of 100,000 flying hours. The 100,000th hour was achieved in collaboration with the Nations? Air Forces in the UK, Italy, Germany, Spain, Austria and the Kingdom of Saudi Arabia with a combined fleet of over 260 in-service Typhoons ? the largest number among the new generation fighters available in the world today. In the UK, the Royal Air Force working with BAE Systems? support, ensure Typhoon is available for full operational duty, protecting and defending the national air space 24 hours a day, seven days a week. The role of the aircraft includes air defence and air interception. The UK?s contribution to the 100,000 flying hours was achieved through the combined efforts of the Royal Air Force at RAF Coningsby in Lincolnshire, RAF Leuchars in Scotland, and Mount Pleasant in the Falkland Islands and also, in a range of operational deployments that tested the readiness, durability and reliability of Typhoon. Chris Boardman, BAE Systems? Managing Director responsible for Typhoon said: ?This is a significant achievement for Typhoon and the partner Nations? Air Forces. Such a milestone demonstrates the extensive operational capability of the aircraft both within the UK and in differing environments overseas. It also increasingly highlights the importance of Typhoon for NATO (North Atlantic Treaty Organization) air defence responsibilities.? Typhoon is Europe?s largest military collaborative programme which delivers unrivalled combat capability coupled with improved situation awareness, high survivability and the most advanced array of integrated sensors makes Typhoon a total solution for the modern Air Force. The series production of the Eurofighter Typhoon is underway, and the aircraft is being procured under three separate contracts (named "tranches"), each for aircraft with generally improved capabilities. The aircraft has entered service with the British Royal Air Force, the German Luftwaffe, the Italian Air Force, the Spanish Air Force and the Austrian Air Force. Saudi Arabia has signed a contract worth ?4.43 billion (approx. ?6.4 billion, $9.5 billion) for 72 aircraft. The Eurofighter Typhoon is unique in modern combat aircraft in that there are four separate assembly lines. Each partner company assembles its own national aircraft, but builds the same parts for all 683 aircraft (including exports). A fifth assembly line will be established for the final 48 Saudi aircraft. Alenia Aeronautica ? Left wing, outboard flaperons, rear fuselage sections, BAE Systems ? Front fuselage (including foreplanes), canopy, dorsal spine, tail fin, inboard flaperons, rear fuselage section, EADS Deutschland ? Main centre fuselage and EADS CASA ? Right wing, leading edge slats. Production is divided into three tranches (see table below). Tranches are a production/funding distinction, and do not necessarily imply an incremental increase in capability with each tranche. Tranche 3 will most likely be based on late Tranche 2 aircraft with improvements added. Tranche 3 has been split into A and B parts.